Parambikulam Wildlife Sanctuary is one of the most scenic places in the Western Ghatsand a biodiversity hotspot. It also has the distinction of being the world’s first ever scientifically managed teak plantation. Part of the Anamalai Hills sub-cluster in the Western Ghats, it is under consideration for selection as a UNESCO World Heritage Site. Located between the Nelliampathy and Anamalai ranges near the Kerala-Tamil Naduborder, the sanctuary spreads across 277 sq km at an elevation of 984 ft to 4593 ft. Started in 1973, the sanctuary was classified as a tiger reserve in 2009. 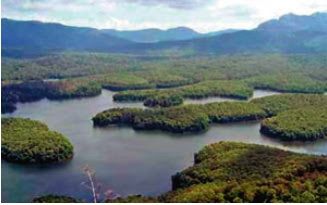 With seven major valleys and three major river systems, the sanctuary has three artificial reservoirs (Parambikulam, Thunacadavu and Peruvaripallam) that are interconnected by canals and rivers. Karimala Gopuram, at an elevation of 4,718 ft, is the highest peak in the sanctuary. The Vengoli Peak is the most popular among tourists as it is easy to climb and also allows the opportunity to spot Nilgiri Tahrs. A variety of trees like teak, sandalwood and rosewood can be seen in the sanctuary that is also home to the oldest and tallest teak trees in the world. The Kannimara teak tree, believed to be over 350-years-old, is the prime attraction of the region. The sanctuary is home to 39 species of mammals, 16 species of amphibians, 268 species of birds, 61 species of reptiles, 47 species of fishes, 1049 species of insects and 124 species of butterflies making it the perfect destination for wildlife and nature enthusiasts. The reservoir harbors several varieties of aquatic fauna including mugger crocodiles that are often seen sunning on its banks. Besides wildlife spotting and boating on the river, the trek along the defunct Cochin State Forest Tramway is among the ‘must-do’ activities in Parambikulam. The tramway set up in 1905 by the Cochin Maharajas to transport teak from Parambikulam to Cochin Harbour was an engineering marvel but was stopped in 1953. Only rails, bridges, wagons, etc. remain of the narrow gauge railway. Trekking in the sanctuary requires prior permission from the forest officials and can only be undertaken under the guidance of experienced forest guides. While power boats are not allowed, to avoid polluting the lake, nature enthusiasts are taken on a short trip on bamboo rafts as a part of the safari. Like the trek, it is essential to travel with a guide. Open throughout the year, the sanctuary can be visited from 7 am to 6 pm (with entry closing at 4 pm) for a nominal charge. However, the sanctuary should be avoided during monsoon as the rains make the hillsides unstable. The trek from Parambikulam Dam to Muthuvarachal and back requires two-days. To ensure your safety during the trek, make sure you are always with the forest staff. Watchtowers dot the sanctuary and monitoring the wildlife from them is a good idea. 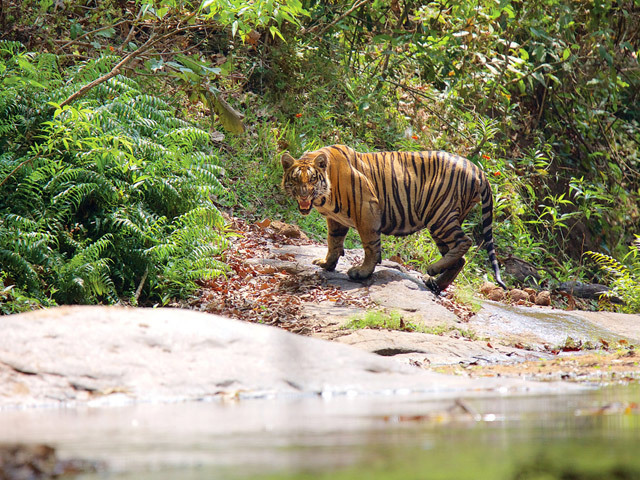 The best place to get a look at a tiger in the reserve is Anakkal Vayal popularly known as the ‘dining table of Parambikulam Tigers’. Follow in on the footsteps of Dr Slim Ali by bird-watching at Kuriarkutty where the legendary ornithologist had stayed for three years. Sail down the river on a house boat made of bamboos by tribal or try ecomeditation deep inside the pristine forest. The consumption of alcohol is strictly prohibited in the sanctuary. The tree-houses located within the reserve forest area in Thoonakkadavu are an ideal place to stay for those looking for adventure but these need to be booked in advance. Apart from this, the reserve offers several options for stay accommodation. The state forest department rest houses at Thoonakkadavu, Thellikkal and Elathode offer comfortable lodging. Tented niches built in the sanctuary are also good and a part of responsible tourism efforts, managed by a joint venture of Kerala Forest Department, Tourism Department and the seven Eco Development Committees performing under Parambikkulam Forest Development Agency. The eco-friendly cottages are twin-bedded Swiss tents with modern attached baths. The Thellikkal inspection bungalow deep inside the forest requires an eight km trek. While basic meals are available at the lodges inside the reserve, it is advisable to carry your own food while visiting the sanctuary.